12. Speaking of Web 2.0, Sclipo was recently awarded "European Startup 2.0". How do you feel about that (somehow controversial) label? What are your thoughts on the present moment and imminent future for Web development? Are you referring to the evolution of web 2.0? If yes, I believe that online user participation is here to stay and bears a lot of potential to change human behaviors - for good and bad - though I strongly believe that the "good" will prevail. Till today, people are bound to "participate" only within a geographically restricted area. You could only make friends within your local school & neighborhood, you could only teach "locally", you could not produce a piece of content (video, text, photos) and make it accessible to anybody anywhere ... you could share you holiday pictures only with friends & family. People before "web 2.0", people where like companies in the 19th century: be local and act local. At Sclipo we believe that breaking local barriers for learning responds to a key need. Why learn Yoga from a guy at the local DIR, if I can learn Yoga from an expert in New Delhi, or from both! 13. The video medium upon which Sclipo is based is very powerful for obvious reasons, but it also has some implicit drawbacks when it comes to knowledge/skills sharing. Basically, that things change and evolve over time, so a video tutorial might age very fast in certain contexts (Web technologies, to pick one of the skills areas you offer in Sclipo). At the same time, a project like Sclipo that depends on user participation would increase its power with a large catalogue/database of videos, but again, the aging of the clips (or the difficulty to port them to other languages, like one can easily do with text on a wiki) might jeopardize that. How do you approach that potential problem for your project? 2. By reducing the cost and time to interact with and "update" video: e.g., video comments, or embedding links into videos to other videos, mash-up videos with other videos. Lots of new technologies will emerge that will help make video a much more editable medium than it is today. 14. Also related to community participation, what is the minimum user number you think Sclipo requires to properly function as a feasible online learning center? How large is the user community at the moment, and what is its approximate growth rate? Do you have a set goal, as far as user number? I don't know. A few hundred dedicated "teachers" should be enough. See the audience of user Carme. Before doing video-tutorials at Sclipo, I think she has never taught. We have millions of visitors and our member based has grown by 400% since June 2007. Goal? To achieve 50-100k active teachers and 0,5-1 mio active learners over the next 3 to 5 years. 15. Is Sclipo economically self-sufficient? How complex/simple is to maintain the project in technical terms (servers, etc.)? Have you received private funding? How about (partly) funding it through publicity? We are not self-sufficient. We strongly depend on funding and it will take at least 3 years till we break-even. Our funding for now is 100% private funding (including VC funding). 16. Do you know of other projects offering similar services as yours? Are you in touch with them or have you collaborated in any way? Yes, we know our competition. We do not collaborate, and I only know personally the CEO of one competitor. 17. There are quite a few video tutorials in the site explaining basic functionality of the tools you provide, or giving tips on how to improve the user's results. Is that a response to a problem you have detected in early stages of development or simply a way to make the whole experience easier? We believe in video-education and we know each product needs to educate about how to use it. So, instead of writing "how-to-use-Sclipo", we create video-tutorials. 18. Can you summarize the experience with the "Academies"? What works, what doesn't, and why? It'd be great to hear your feedback about "Academies". Academies are great for people who solely teach, but for people who just want to learn, an academy profile does not really work. We are working on evolving the academy concept in the next 3 months. 19. How about SclipoLive? Apart from the technical aspects of this functionality, can you talk about the idea? Is it as popular as the regular skills videos? As said above, SclipoLive is a main part of our value proposition. Mainly - see above - because it allows for personalized teaching. You can also record classes and review them as often as needed. 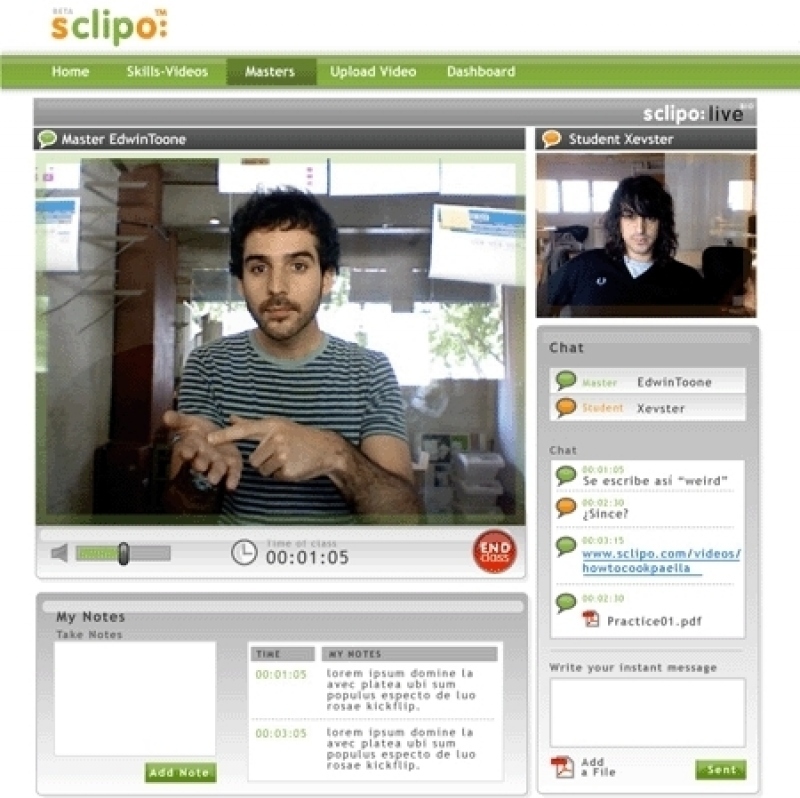 SclipoLive was highly welcomed by many top-experts (see Techcrunch and Mashable) but users are still not using it a lot. This has to do with technology barriers, but also because we at Sclipo have not promoted the service enough yet. We are lacking resources. 20. Quality is often a concern in many online resources offering knowledge and information. Wikipedia, to cite a successful and massively used tool, has managed to overcome that obstacle through a very thorough system involving standards, dedicated editors and so on. Is there any previous filter for the teachers offering courses on Sclipo? "You can teach what you want, as long as it's legal", one of your tutorials says. For now yes. In the future, dedicated editors will be needed just like at Wikipedia. 21. Open licenses can ensure the future of a project beyond its original range. How important are licenses and authorship issues in your project? Would you care to elaborate on your views on that? How does sclipo deals with copyright issues? 22. Would you accept to act as regular Bank of Common Knowledge consultant? Which value or kind of exchange apart from money could you imagine for such a "knowledge" transaction? The Bank of Common Knowledge sounds like a very interesting project, and I would love to learn more about it. My main expectation from such collaboration is a better understanding of our users so we can adapt Sclipo to their needs. Hope we can learn from each other.